Folio thinking is a process of engaging in the collection, organization, reflection and connection that leads to a person’s ability to speak intelligently and concisely (i.e. tell stories) about one’s learning experiences, what they mean and their value, and how the experiences relate one to each other. Folio thinking is a habit of mind. Practicing folio thinking pedagogy is to create an environment that helps students look back at their learning from a new perspective and show development over time, reflect about the personal meaning of the experience and integrate the experiences, look forward to future approaches to learning, , and express the story of their learning to others. We are story-telling beings, and telling our stories to varied audiences helps us discover a deeper, broader understanding of ourselves as learners. The bonus: implementing folio pedagogy also provides the kind of evidence of learning and achievement of student learning outcomes that we need for course, program and institutional assessment. 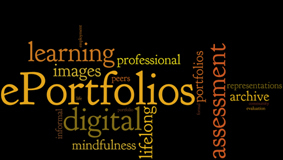 Portfolios go with folio thinking pedagogy. Variously described as a collection of work, a journal, a personal learning map, or a curated collection, a portfolio documents a process of inquiry and reflection for the life-long learner. ePortfolios help us tell our story with the support of technology. They allow us to construct multiple views and frame representations of our learning within the views, and to choose and organize the representations according to our understanding of the connections between those representations and the context for each view (audience, point in time, purpose). Support for presentation (to tell the story of our learning – because learning is not a solitary journey, it is shared inquiry, and creating an ePortfolio can break the artificial boundaries across courses and between school and “real life”. Students who wait until their senior seminar or capstone course to try to pull together and organize their work, to show that they have achieved a required learning outcome, often discover that they don’t have copies of the work they were going to use to demonstrate that achievement – they don’t have that computer any more or it crashed, the files are on a thumb drive they can’t find . . . The single most important skill to help potential employees get in the door is the ability to self-reflect and to be able to articulate the connections between their experiences and the needs of the job they are applying for. They need to be able to concisely articulate what they did (skill, competency or ability), how they did it (a story), and why they did it (thought process about the choices they made). Creating an ePortfolio is the process of engaging in collection, organization, reflection and connection that leads to a person’s ability to speak intelligently and concisely about the what, how and why. In other words, to tell the story about themselves. The tools work well from the learner’s perspective, but institutions find they are difficult to use to meet program and institutional assessment needs. There is a tension between flexibility and creativity vs. imposed structure, student-owned vs. institutional access, and use for self-marketing vs. for program assessment. Designing a portfolio framework that supports faculty, program and institutional learning and creativity as well as individual learners is a challenge. There are learning management systems that have an ePortfolio component; widespread implementation of their use is sketchy, mostly because students don’t have the motivation to keep their ePortfolio populated, and only store artifacts for a scattered set of isolated classes. There are specific ePortfolio applications created for institutional use, for example, Mahara. Assessment management systems are applications which support institutional assessment needs. Several of these emerged from accreditation requirements for schools and colleges of Education, who are required to collect, store electronically, and provide to accreditors substantial evidence of achievement of student learning outcomes. New entrants into the assessment management system market (for example, Livetext) are offering more accessible ePortfolio features (and older companies are refining their offerings). Other ePortfolio applications such as Digication are designed with the Russian nesting doll methaphor – supporting assessment of the individual student, the course, the program, and the institution. These applications are not particularly low cost, and this may be a challenge to institution-wide adoption. Use one ePortfolio application to serve as an organizing framework throughout a student’s career at the institution. Account for multiple entry (and exit) points for students, for transfer students and stop-out students, for example. Build in reflection points where faculty are prepared to engage with students within the portfolio framework (which is a pedagogy, not a technology). Establish 4 structured reflection points: entry to the university (including transfer students), entry to the major, midpoint, and at end of the student’s coursework. Prepare faculty – particularly adjunct faculty – to effectively engage with students within a portfolio framework. Provide options for unstructured reflection points chosen by student. Over time, work toward at least one signature assignment intentionally organized around reflective learning in all courses in the Marylhurst core- specifics to be determined by the instructor – creating an opportunity for learner engagement with their portfolio at multiple points. Work with faculty to create a set of reflective prompts which could apply across all disciplines.